"Worth a lot more than it costs." - Antoleen from Ashwood Interiors. "Fantastic service, thanks a mil!" 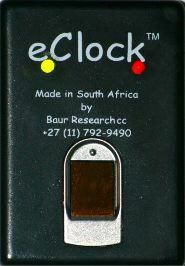 The eClock is an easy to use, extremely fast, rugged and economical clocking machine. Employees use their fingerprint or alternatively a touch tag to clock in and out. The eClock prints time-sheets calculating gross pay, holiday pay, PAYE and UIF. You gain the advantage, when you rent an eClock, of free on site service. Designed and built in South Africa to perform under local conditions.